Debates are the political equivalent of speed dating. Candidates have snippets of time to define themselves, differentiate themselves from their opponents and connect with the crowd. 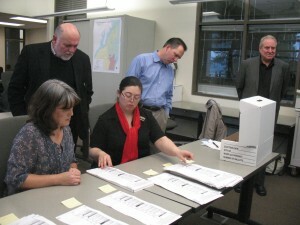 We at the Kitsap Sun will be doing in-depth articles articles on local races and ballot issues. Debate coverage, on the other hand, could be seen as more superficial but also more immediate. Here’s what I took away from this morning’s debate hosted by the Port Orchard Chamber of Commerce. Races featured were the Port of Bremerton Commissioner, District 3, and Kitsap County Commissioner, District 1 (North Kitsap), neither of which I’m doing the in-depth coverage on. In the commissioners’ debate, Republican Chris Tibbs took every opportunity to set himself apart from incumbent Commissioner Rob Gelder. Gelder was appointed in March to fill Steve Bauer’s position. Interestingly enough, Tibbs considers himself an “independent moderate” and has contributed to Democratic campaigns in the past. His goal in this race seems to be to diversify the all-Democratic board of commissioners. Democrat Gelder countered that he doesn’t automatically align with fellow commissioners Charlotte Garrido and Josh Brown. Tibbs, director of sales and operations for Ootopia coffee roasters, touted his business experience and said he would run the county with a more stringent eye to the bottom line, fully funding justice, roads and land use, and cutting as needed in other departments. Tibbs would be looking to “shed layers of employees” but also wants to restore the county to 5-day per week service versus the current 4. Tibbs blasted the county’s “lack of transparency,” citing the Shoreline Master Plan Update process and the county’s legal tangle with Kitsap Rifle and Revolver Club as examples. Gelder, now on the defensive, said the county has come a long way in increasing transparency, especially in the budget process. (Both Gelder and Tibbs served on the county’s budget advisory committee). Concerns that the Shoreline Master Plan will decimate individual property rights are not justified, Gelder said. The public has and will continue to be involved in the planning process. Gelder said the county has made strides toward a sustainable budget and the board is on track to rebuild the general fund reserve account. He cited recent refinancing of bonds that will save an estimated $1.7 million over time as an example of the county’s more proactive approach to balancing the budget. Gelder also defended his background in nonprofits as valid experience for the job of commissioner. “Running a not-for-profit requires you to be even more creative to make payroll,” he said. The two candidates hold 180-out positions on Kitsap County’s membership in the Puget Sound Regional Council. The council, which also includes King, Pierce and Snohomish counties, oversees distribution of state and federal transportation funding. In the nonpartisan Port of Bremerton debate, candidates Axel Strakeljahn and Shawn Cucciardi had a harder time setting themsleves apart from one another. Both candidates talked of the port’s need for a solid short- and long-range business plan to promote economic development. Both touted their business experience as credentials for the job. Strakeljahn manages the Port Orchard Fred Meyer. Cucciardi manages McCormick Woods Golf Course & Clubhouse. Cucciardi said he’d pump up marketing of the port. Strakeljahn said he’d make sure any business decision made by the port commission pencils out. He would “hold the line on taxes” he said. So there you have it, just a few notes from the debate, for what it’s worth. Last week, the Kitsap Sun editorial board heard from candidates for the city of Port Orchard at-large position. Video of the debate between Ben Pinneo and Jerry Childs is posted on our website (and below). Editor David Nelson, on his “From the Editor’s Desk” blog, fills in candidates’ comments where the tape cut off early. Today, the ed board will hear from mayoral candidates Tim Matthes and incumbent Lary Coppola, and from candidates for position 5 Amy Miller and Cindy Lucarelli. I sit in on the debates, but I’m not involved in any discussion of endorsements, which come from the editorial board. If you have any questions you’d like me to ask the candidates, call by 3:30 p.m. (360) 792-9219 or email chenry@kitsapsun.com. For more on this election season, see the Kitsap Sun’s Election Guide. SILVERDALE — First out on the campaign trail for the open Port of Bremerton commissioner post is Axel Strakeljahn, who got a few words in at a meeting of the Kitsap County Republican Party on Monday evening. Strakeljahn, pronounced Streck’-el-john with a short e in the first syllable, got a wait-and-see reception from the 25 or so who attended the meeting at the Silverdale Beach Hotel. Not surprisingly, one of the first questions he got was whether he would raise taxes. “No, sir,” responded Strakeljahn, longtime local home-and-garden businessman, fiscal conservative and current manager of the Port Orchard Fred Meyer. He suggested instead that the port and the cities of Port Orchard and Bremerton become “a cohesive working unit” to promote tourism and a healthier business climate. He took exception to an early and informal suggestion by one current commissioner, Bill Mahan, that the port consider hiring a consultant to come up with a plan to promote an “industry cluster.” According to Mahan, identification and promotion of an industry cluster would strengthen the ties and attract new players in a certain industry, say in boat-building. Mahan has said the $200,000 cost could be shared by many entities that would result in only a small cost to all. Strakeljahn said that was a bad idea. The matter is expected to be further discussed at an upcoming port study session. Strakeljahn, who built his own house in Seabeck, said that after three decades of leading businesses in Kitsap, it was time for him to give back to the community. He said he has endorsements from state Rep. Jan Angel and others. The only other person who has announced he will run so far is Shawn Cucciardi, an owner and general manager of McCormick Woods Golf Course and the Clubhouse Restaurant at McCormick Woods. Port commissioner District 3 is being vacated by Mahan, who is retiring. The expansive district covers much of south and west Kitsap. Shawn Cucciardi, general manager and an owner of McCormick Woods Golf Course and the Clubhouse Restaurant at McCormick Woods, announced today that he will run for Port of Bremerton commissioner position 3, being vacated by longtime commissioner Bill Mahan. Port Orchard Fred Meyer manager Alex Axel Strakeljahn already has announced he will run for the position. Cucciardi said he would make it a priority to court port tenant Safe Boats, which employs 260 and plans to hire more. The port is mulling a “marine cluster” to entice Safe Boats to stay. “Our priorities are to create and maintain jobs by retaining current tenants like SAFE Boats and focusing on a long term development plan to increase business revenue and make the port fiscally self-sufficient,” he said. Filing week starts on Monday. We’ll do our best to keep readers up to speed. Feel free to contact us with notice of your candidacy: chenry@kitsapsun.com or sgardner@kitsapsun.com. Our apologies to Mr. Strakeljahn for an earlier misspelling of his first name. Cindy Lucarelli attended a candidate forum Thursday at Port Orchard city hall, but she’s not certain she’ll make another run for public office. In 2009, Lucarelli came within 12 votes of unseating long-time councilwoman Carolyn Powers in a race that triggered a machine recount. Lucarelli lost in 2007 to John Clauson, another council veteran, who is up for re-election this year (position 4). With filing week just more than a week away (it starts June 6), Lucarelli, organizer of the city’s Cedar Cove Days, is saying she’s still on the fence, with “several factors” playing into her decision whether to run. Other city of Port Orchard positions open are: mayor (incumbent Lary Coppola has announced he’ll run), position 1 (incumbent Jim Colebank), position 5 (Fred Olin) and at-large (Jerry Childs). None of the incumbent councilmen have made their intentions known. If you’re considering running for public office, the city of Port Orchard is hosting a presentation today at city hall that could be called Candidates 101. The event will cover how to file for office and rules about campaign finance, among other topics. Filing week is June 6 through 10 at the Kitsap County auditor’s office. The workshop is from 5 to 8 p.m. at city hall. Offices open in the city of Port Orchard and the Port of Bremerton are listed below. Port Commissioner Bill Mahan has said he won’t run again. Mayor Lary Coppola has announced he will. Check websites for school board, fire district and utility district seats up for election.